Phalaenopsis orchids are one of the most popular flowering houseplants in the world. They have had a meteoric rise in popularity over the last 20 years due to their exquisite beauty, falling prices and wider availability. They’re fairly well suited to indoor climates and are surprisingly easy to care for. This article covers 15 phalaenopsis orchid facts for your enjoyment and education. Phalaenopsis orchids are often known as Moth Orchids. Phalaenopsis orchids were actually named after the Phalaena genera of moths, as they were thought to look like moths in flight. So really the name phalaenopsis means the moth-like orchid. I’m not sure this really does the beauty of this amazing flower justice, but there you go. Although most phalaenopsis orchids that you see as houseplants are grown in pots, they don’t actually grow in soil in their natural habitat. Moth orchids are epiphytic plants, which means they obtain their nutrients and water from the air. They attach to the branches or trunks of trees. They only use the host tree as a home and aren’t parasitic to the tree in any way. When keeping phalaenopsis orchids at home, you will soon see them growing aerial roots, which grow up out of the pots. If you keep a phalaenopsis orchid for long enough, it will develop multiple tendril-like aerial roots which will spill out of the pot and hang in the air looking for water and nutrients. Don’t be tempted to cut these off, as they are an important part of the plant and removing them could negatively impact the orchid. Although phalaenopsis orchids are tropical plants, they grow in the wild under the tree canopy. They are accustomed to indirect, muted sunlight, and don’t do well in direct sunlight. If they are exposed to prolonged direct sunlight, you can get scorching and burn marks on the leaves and exposed roots. You will also find the leaf tips can blacken, the leaves will fade and become yellow, and the leaves can also split down the middle. If you notice any of these signs, make sure to move your orchid to somewhere with less intense light. Phalaenopsis orchids look really exotic and tropical, so it probably comes as no surprise that they are native to tropical regions of south-east asia, such as the Philippines, parts of Australia, Thailand, Taiwan and the himalayas. There is even an island off the coast of Taiwan which has been renamed Orchid island due to the abundance of phalaenopsis orchids which grow here naturally. Phalaenopsis orchids were around when dinosaurs walked the earth! According to the fossil record, phalaenopsis orchids could be as old as 100 million years old. Clearly they have incredible staying power. Whilst the orchids that existed so long ago likely looked quite unlike the orchids that we keep in our homes today, there is a clear lineage from these ancient ancestors to the common and beautiful moth orchids of today. Phalaenopsis orchids are the longest blooming of the orchids commonly grown as houseplants. When you buy a phalaenopsis orchid at the store, you can reasonably expect it to flower for at least 2 months, and often for up to 6 months at a time. Combine this with the exquisitely beautiful blooms of these orchids, and it’s not hard to see why they are the best selling flowering houseplant in many regions of the world. One top tip to ensure your phalaenopsis orchid blooms for as long as possible, is to buy one which still has plenty of closed buds. The flowers will appear one by one towards the end of the flower spike. If you can resist the temptation to purchase a plant which is in full bloom, you may prolong the display of flowers from your plant by many weeks. Don’t be fooled into thinking phalaenopsis orchids are difficult to care for just because they look so delicate. Many people are apprehensive about trying to look after moth orchids as they look so delicate and beautiful. It’s easy to make the assumption that they would be difficult to care for. In fact, the opposite is true. They need watered infrequently, are light feeders, and as long as you keep them out of intense sunlight, it’s hard to go too far wrong. If you are lucky, your orchid might start to develop a new baby orchid from right on the the flower spike of the parent plant. These are often called keiki, and over time, they will grow leaves and roots and develop into fully fledged orchid plants. Once they develop 1-2 inches of root length, they can be separated carefully from the parent plant and potted in their own container. There are various methods for encouraging your orchid to grow a baby, but that’s a topic for another article. Not all phalaenopsis orchids produce a fragrance, but of those that do, it is usually more pronounced at sunrise. White orchids don’t produce any scent, but many of the other colors of orchid produce a delicate, sweet scent which you will definitely find to be most prominent in the morning. How nice to wake up to the smell of flowers in your home. Moth orchids used to be very expensive and difficult to find. Part of the reason was that they are difficult and time consuming to grow from seed. It can take several years for a new plant to go from seed to sufficiently grown to produce blooms. Commercially produced moth orchids are grown in large batches from tissue taken from adult plants. These are grown for about a year in a lab, before being transplanted into a greenhouse for another two years. It’s only after this that they are big enough to produce flowers. Sales of phalaenopsis orchids have grown rapidly since the late 90s, when commercial cultivation techniques were perfected and expanded rapidly. Approximately 90-100 million phalaenopsis orchids are produced in Europe every year. Many people enjoy the blooms from their moth orchid for a few months and once the flowers drop, they assume the plant is dead and it gets thrown out. However, phalaenopsis orchids can re-bloom time and time again, once or twice per year, for months at a time. It isn’t difficult to make an orchid bloom again, so you should definitely hold onto your orchids for the long term. Phalaenopsis orchids can be encouraged to bloom by exposing them to lower nighttime temperatures for a few months. This tells them it’s time to produce a new flower spike, and before long, you’re well on the way to another wonderful display of spectacular blooms. 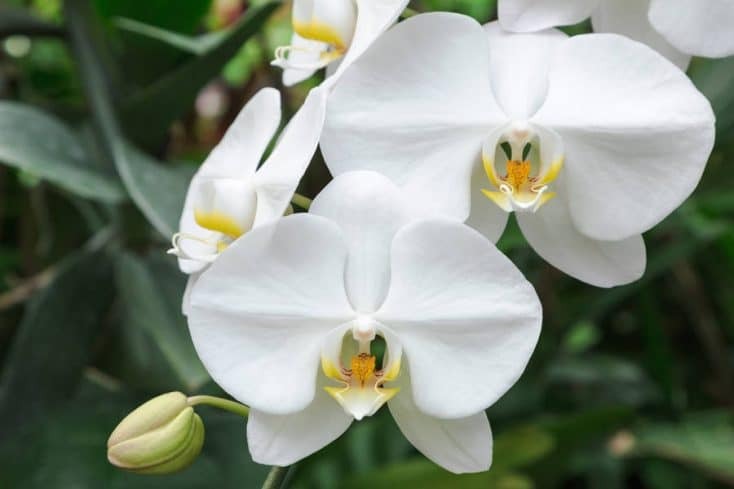 The Phalaenopsis amabilis or Moon Orchid is one of the state symbols of Indonesia, chosen for its beauty, it is a symbol of international pride. Quite a number of other countries around the world also have orchids as their official flowers. Once your orchid has finished blooming, if you cut the stem above the 3rd or 4th node and wait, the plant will often start to grow again from one of the other nodes, producing a second crop of flowers. In this way, you can encourage your orchid to bloom for many months of the year. With good care, a phalaenopsis orchid can live for decades. There are even some orchids today that have been alive for over 100 years. So when you buy an orchid as a gift, or to brighten up your home, it could become a family heirloom, passed down the generations! 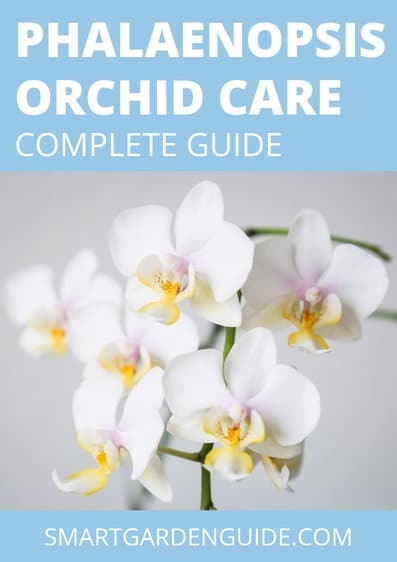 If you want to learn more about phalaenopsis orchids, why not download my free phalaenopsis orchid care guide, or check out my other articles about orchid care.